Ever since the infamous UFC 223 bus attack, only the location had to be decided for when these two were going to fight. With this card well on the way to becoming the biggest UFC pay-per-view of all time, Conor McGregor is well and truly back. However, his comeback fight is against the undefeated Dagestani bear-wrestling phenom that is Khabib Nurmagomedov. Khabib is going to be looking to take down Conor as soon as the first bell rings as Conor has shown clear weaknesses in his ground game. This tactic clearly works for “The Eagle” as boasting a record of 26-0 at this level of MMA is unheard of. Conor will be looking to keep this fight on the feet as 18 of his 21 wins have come via knockout with Khabib’s standup being his only known weakness. One of the many reasons this fight is such an awesome fight is because each fighter’s strength is the others Achilles heel. With the fight starting on the feet, I believe that Conor will have early success against Khabib but contrary to popular belief, Khabib has a chin. MMA fans tend to make a big deal out of the first few minutes of Khabib versus Michael Johnson where Khabib got caught and was clearly struggling for a few seconds. It is important to contextualize this as Johnson landed a clean right hand on Dustin Poirer and it completely melted him as Johnson has legitimate knockout power at 155lbs. Aside from that Khabib got hit by a spinning wheel kick against Barboza and ate it and carried on pressing forward, clearly showing he can take a hit. 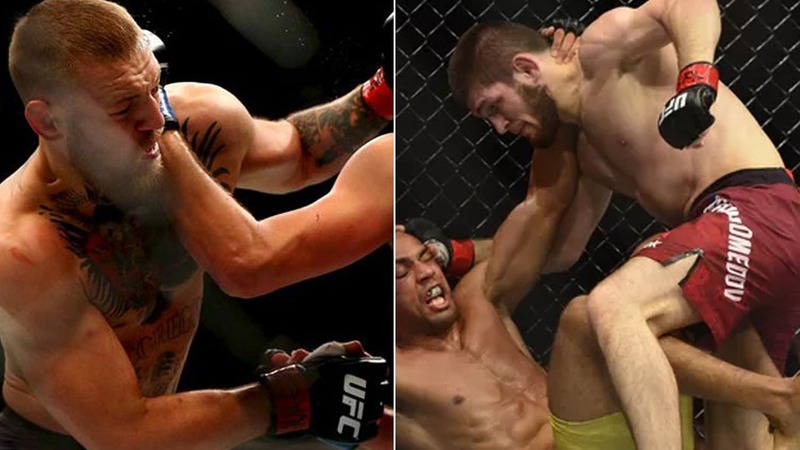 Admittedly, it is hard to compare these examples to Conor’s lethal left hand but this is the only evidence we have of Khabib showing any sort of weakness inside the octagon and in both these fights he violently mauled his opponent. Khabib and Conor are incomparable on the ground. Conor showed improvements in his takedown defense in the second Diaz fight however I don’t think that’s enough to stop the imminent takedowns from Khabib. McGregor versus Mendes displays this as Conor was taken down with ease. He has also shown cardio issues throughout his career while Khabib went 5 rounds against Al Iaquinta easily. Ring rust may also play a factor for Conor as fighting after a long lay off has often seen fighters admit to this. When the first bell rings, I believe Khabib will press him with awkward movement. Khabib will manage to clinch and take him down and then proceed to do what Khabib does best and I find it hard to believe Conor will have any sort of answer for this. I see this fight lasting 3 rounds because Khabib will relentlessly ground and pound Conor to prove a point and then I believe Conor quits or the referee stops the fight.